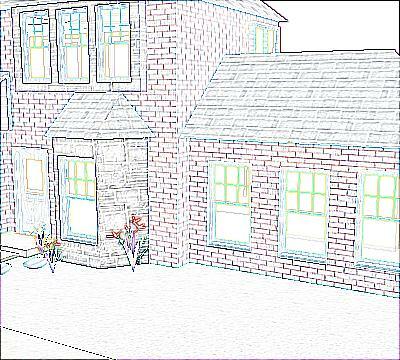 RpImageFilters is a free Plugin for SketchUp to apply filters to SketchUp images. Image Filters are used to brighten, darken, add contrast to, or sharpen up your SketchUp image, (or apply other filters). Proceed to Downloads Page to download a copy of RpImageFilters. After downloading the ZIP file, open it and click Click here to install RpImageFilters to install it. 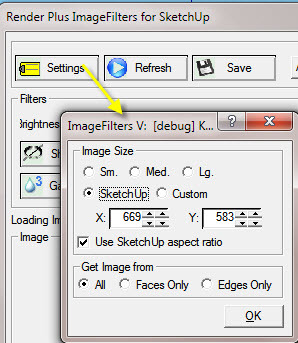 After Starting SketchUp, Select 'Load RpImageFilters from the SketchUp Plugins menu. Image Size - select the size of the image to filter and save. Get image from - get special image modes - faces only, edges only, etc. Refresh - reload the current SketchUp window as the base image. Save - save the filtered image to disk. About - load the About Box to view the version, etc. Close - close the Wizard. Undo / Redo - remove or restore filters you have applied. Reset - reset Tone Operator or Filters to the default values. - Zoom all fills the dialog with the image. 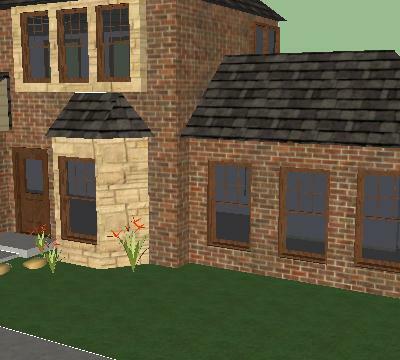 A brick house downloaded from the 3D warehouse rendered in SketchUp. Saturation increased by 10%. Higher values add more color. Lower values move towards gray scale. Software sharpening creates enhanced sharpness by making the edges more contrasty. The algorithm notices when colors or intensities change in the image and sharpens up the transitions. You can apply this, and other filters repeatedly to enhance the effect. 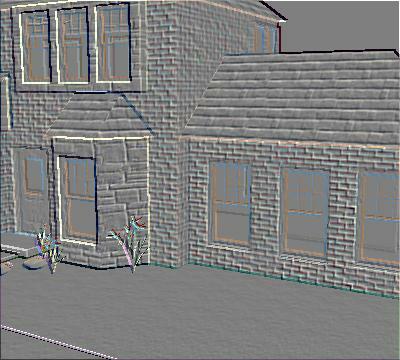 Just a little sharpening can add detail to a rendering. Softening smooths out the transitions at "edges" - where the color or the intensity changes. Gamma filtering changes the intensities of colors to work better when displayed on a CRT screen. This image had a gamma factor of 1.2 applied. A Gaussian Filter provides smoothing over a wider range (3 x 3 or 5 x 5) of pixels. The Emboss filter creates the effect that an image is embossed into a thin metal plate. The Edge Filter recognizes edge transitions and displays only the edge lines. Setting the Saturation to 0 produces a gray scale image.